Jamaica suffered a serious slip-up in Central America, two defensive errors helping hosts El Salvador register a 2-0 Nations League success on Saturday. With head coach Theodore Whitmore’s troops requiring just a point to secure a place in this summer’s Gold Cup final, Jamaica’s Reggae Boyz shot themselves in the foot during their final CONCACAF Nations League (CNL) qualifier. 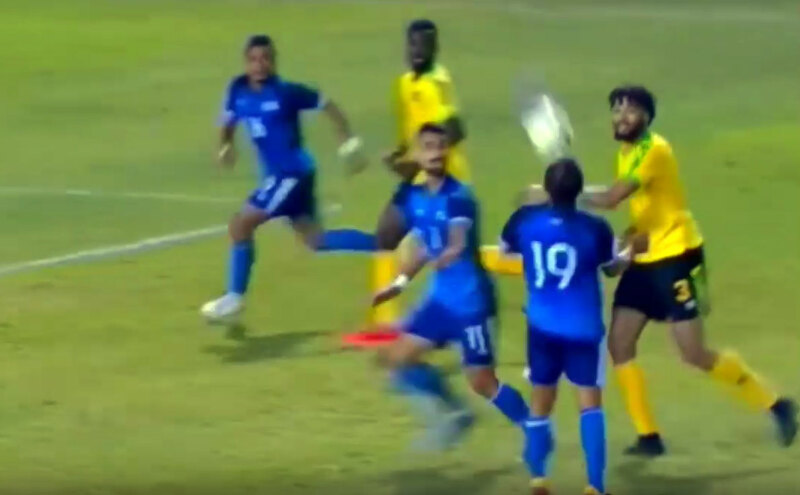 Goalkeeper Andre Blake gifted El Salvador their opening goal early in the second-half, and the captain should have prevented Damion Lowe’s late own goal that proved the nail in the coffin for the Boyz on their miserable night. To add insult to injury Darren Mattocks lost his cool in injury time, shown a straight red card for flattening a defender. Jamaica’s participation in the Gold Cup finals, where they have finished runner-up in past two competitions, remains in the balance and it is now reliant on other CNL results. Hosts El Salvador proved too hot to handle at the cauldron of Estadio Cuscatlan in San Salvador, constantly looking for the breakthrough in what became a midfield battle of attrition. Following all the good work that Whitmore had invested recently by utilising those who play across the island in the Red Stripe Premier League, he cautiously reverted back to a very familiar-looking line-up. Five Major League Soccer (MLS) stars started. Blake joined his club colleague Cory Burke from Philadelphia Union and FC Cincinnati team-mates Mattocks and Alvas Powell were selected. Yet the biggest surprise was the inclusion of New York Red Bulls’ Kemar Lawrence, whose recent injury has kept him out of MLS action this season. Unfortunately this was the same sort of starting 11 that his predecessor Winfried Schäfer stuck with but ultimately xost him his job as they lacked scoring prowess and nous. The Boyz were on the back foot from the first whistle, with their tactics clearly only to counterattack because they had faith in the back four and the normally solid skipper Blake. They were particularly nervous-looking after Michael Hector got an early yellow card, aware that a reversal could cost them not only a place in the lucrative Gold Cup finals but also deny them CNL progress. The hosts totally dominated the opening half, but there was very little goalmouth action to keep the packed stadium entertained. After the turnaround Blake made a glaring error when he mishandled a long-range free-kick and dropped it into the path of the hovering Nelson Bonilla, who accepted the gift to bundle home the loose ball for a 49th-minute lead. The Stadium erupted with a combination of joy and relief for their deserved breakthrough, and from then on the home fans cheered every successful pass from their team – and booed each touch from Jamaica’s lacklustre Boyz. The hosts hit their only purple patch on the hour-mark, which lasted a mere give minutes, but Bonilla fluffed their best opportunity with a sliced effort following an impressive sprint and pass from Oscar Cerén. Seconds later and on a rare Jamaica attack Mattocks was guilty of wayward shooting when he was handed the chance to grab an equaliser, skying his shot way over the gaping goalmouth. The ever dangerous Cerén instigated a slick move that made a mockery of the Jamaica’s counterattack only tactics. The Boyz’ back four were in disarray and Lowe scorex an 86th-minute own goal past hapless Blake, when they should have easily cleared the danger from a header. And at the death, deep into injury time, Mattocks rightfully received his marching orders for being over zealous in the box. Jamaica, having previously won their first three CNL qualifiers, havs had their aspirations to qualify for the Gold Cup finals put on hold. They have to play the waiting game for other CNL results to see if they will earn qualification into League A of the inaugural CNL. Regardless of what happens it has to be back to the drawing board for Whitmore after this severe set-back and poor showing. Faiilure to be part of the prestigious Gold Cup finals would prove costly for the Jamaica Football Federation, and maybe Whitmore’s future as head coach.